Deemples is a free, reliable and easy-to-use golf buddies app. Moreover, with Deemples, you can find your golf partners easily since there are a lot of active users especially from Southeast Asia. 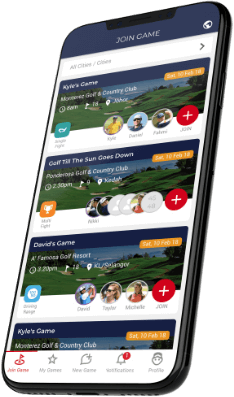 Deemples make it easy for golfers who are looking for a game or for golfers who are hosting games to find participants. Why You Should Use the Deemples Golf Buddies App? One golf game can takes up to 4-5 hours for 18 holes, 2 hours to travel both ways, and 1-2 hours to eat and shower. So in total, it is about 8 hours of activities or pretty much the whole day. At the same time, schedules for a golf games are getting tighter since people are getting busier and everyone has less time. This makes organising golf round a pain for most golfers because they need to check one by one who’s available for the game or where each golfer prefers to play, etc. It got to a point where most golfers just want to get in a game regardless if their friends could make it. But then again, who likes to golf alone? For golfers who have a 9-5 job and a family to take care of, a simpler solution was needed. Deemples was created exactly for this reason, to help both new and seasoned golfers to connect and play golf together whenever and wherever they want to. So here are 5 things you can do in Deemples, so that you can find golf buddies in no time. Just pick which game you want to play and click the “plus” button as shown above. Then, you’re in! If you did not find any game that suits you, the “new game” tab brings you to the page to create your own game. Then just wait for other golfers to join. Chat with your new golf buddies before the game. There’s a chat function that only golfers that have joined the game can access within this golf buddies app. Get to know your golf buddies before you get onto the course. You might even be able to share rides if you’re traveling from the same areas. After playing together, give your playing partners a good rating so that other golfers playing with them in the future know that they’re trustworthy, decent, punctual, and generally nice people. In addition to rating them, you can also input their scores with the right course and slope rating so that they can get an accurate handicap index. You cannot input your own scores to keep it fair, but you can definitely ask your playing buddies to key in your scores for the day through their Deemples account. More information on scoring and handicapping on Deemples here. Go to the “profile” tab, where you can create your own profile. Tell others how long you’ve been golfing, where you’re from, what do you do, and any other information that you would like to know from other golfers before playing with them. You can also view your last 10 game scores here, as submitted by your playing buddies. Once you have a minimum of 5 scores submitted by your playing buddies, Deemples would then be able to accurately calculate and display your handicap index that you can use for future games. No problem because you can try the Driving Range game type as you might not be ready to get on the golf course. However, everyone is new to golf at some point, so don’t worry if you don’t know anything about golf. Create a driving range game on Deemples and then you can ask questions to the other golfers who join your game. It’s tough getting into golf, so we hope with Deemples it can allow you to meet other golfers who can help you out. Deemples is always ready to help you!